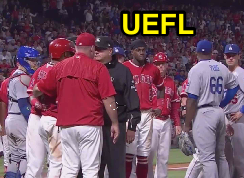 Los Angeles' Dodgers and Angels (of Anaheim) cleared the benches after a HBP to Yunel Escobar, with the Dodgers' broadcast wondering why Escobar would possibly be upset while the Angels' crew dug up a brief history between Escobar and Dodgers starting pitcher Clayton Kershaw. LA's Dodgers and Angels clear the benches. With one out and runners at the corners in the bottom of the 8th inning of a 6-2 Dodgers ballgame, Blue Crew pitcher Brandon Morrow hit Halo batter Escobar up-and-in with a first-pitch 96-mph fastball, upon which Escobar pointed into his own dugout before yelling at Morrow as the benches and bullpens cleared and Dodgers catcher Yasmani Grandal spoke with Escobar, with HP Umpire Tom Woodring, 1B Umpire Jerry Layne, 2B Umpire Mike Estabrook, and 3B Umpire Marvin Hudson helping to separate the teams. The game proceeded without incident and concluded with no ejections. Videos via "Read More"